UPDATE: Bill will have this book for free on Amazon from July 26 to July 30. Pick you your copy and put your review in the comments! CRM Archaeologist, author, founder of Succinct Research, and podcaster on the CRM Archaeology Podcast, Bill White has a new book out! 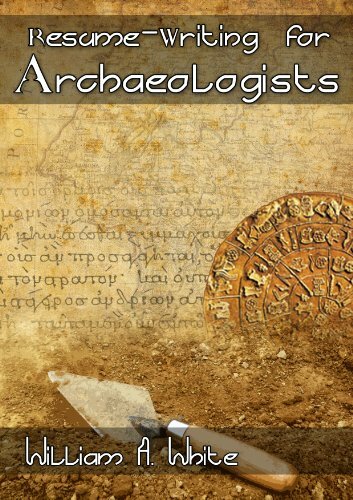 This is another great resource that every archaeologist should own. Even non-archaeologists will get some great information from this eBook. The book is available on Amazon for about $5 as an eBook. Save it to your smartphone or tablet so you can access it whenever you need to. With a great layout and organization this book helps you recognize where you can improve your existing resume or can help you create one from scratch. Bill talks about, not only what makes a resume attractive to employers, but, also how to design your resume so it actually has a higher profile when job search software is used. There are certain buzz words and other words that you can put in your CV to ensure that the screening software your future employer is using puts your CV in the "call" list. Even if you've been a CRM archaeologist for many years you can still benefit from the information in this book. Download it and keep it as a reference for when you need your next job. Thanks for reading and I'll see you in the field!